Acts of gender‐based violence — including social discrimination, harmful cultural practices and family violence — are committed throughout countries of varied cultural and religious traditions, political systems and socio‐economic development. Trafficking in Persons (TIP), one of the worst forms of gender‐based violence, is often preceded and caused by the inferior position of women and girls in families, communities and societies. 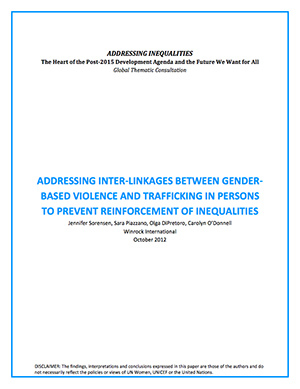 In countries where poverty rates are high and gender inequality is pervasive, gender‐based violence can lead to the abuse and isolation of women and girls, and increase their vulnerability to being trafficked.